Batman is the world' greatest detective that can track super villains and go tow to toe with the biggest and baddest of them all. Kids love The Dark Knight and will go nuts with a Batman themed birthday party. With everything from Batman centerpieces and party favors to cool cups and plates, A Party Source can create the ultimate Batman birthday party for your child. Why go anywhere else when you can get everything in one place. Spring into action with Batman Party Supplies! These classic and complete Batman Party Supplies feature the Caped Crusader on themed tableware, plates, napkins, cups, and party kits. Add party favors, decorations, and invitations to Batman Party Supplies for a knockout birthday bash that all of Gotham will enjoy! Mix Batman Party Supplies with our solid color tableware for a custom birthday theme. Batman Heroes and Villains Birthday 9" Square Luncheon Plates, 8ct. 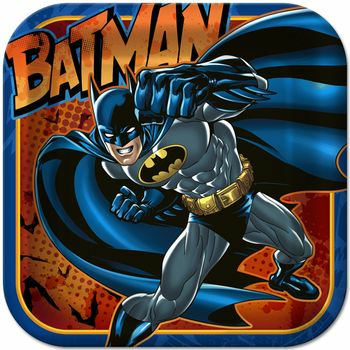 Batman Heroes and Villains Birthday 7" Square Dessert Plates, 8ct. Batman Heroes and Villains Birthday 9oz. Paper Cups, 8ct. Navy Blue 2-Ply Lunch Napkins, 50 ct.
Navy Blue 2-Ply Beverage Napkins, 50 ct.
Batman Heroes and Villains Birthday Cape, 1ct. Batman Heroes and Villains Birthday Banner, 1 ct.
Batman Heroes and Villains Birthday Party Invitations, 8ct.